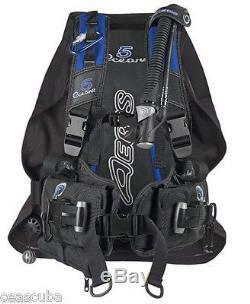 New in the bag Aeris 5 OCEANS BCD Blue/Black Version, Size 2XLarge. Yes We are an Authorized Aeris/Oceanic Dealer. 5 Oceans BC, Blue / Black. Traveling 20 miles to a local dive site or packed away for the trip of a lifetime, the 5 Oceans performs phenomenally in all conditions. The 5 Oceans Back Inflation BCD is prepared for any adventure - its lightweight weighing 7.5 lbs (3.4 kg) and packs flat for travel to the tropics and, at the same time, supplies plenty of lift, integrated weight capacity and range of adjustment to be worn in cold water over thick wetsuits or dry suits. The 5 Oceans air cell uses a combination of BioFlex material and bungee cords to maintain the streamline profile, yet allows for 40 lbs (18 kg) of lift. Your equipment should enhance, not hinder the joy and exhilaration of diving. Nowhere is this more important than with BC's, where comfort and freedom of movement must be balanced against function and durability. Responding to this challenge led Aeris design engineers to create Bioflex - a unique "living fabric" that stretches, flexes and conforms to the body. BioFlex is an extraordinary fabric, which stretches, fully inflated up to 30% over conventional nylon or polyurethane BC materials, the idea being that if a material could stretch while remaining airtight, you could make smaller air cells, creating less bulk and drag underwater while achieving high volumes of lift when required. Durable fadeless 1,000 Denier Cordura construction. Exterior abrasion points of the 5 Oceans are covered with this new "Fadeless" material- tough stuff that will hold up to years of extreme diving and keep that "new look" longer. Aeris Quick Lock & Release (QLR) Integrated Weight System that can accommodate up to 20 lbs (9 kg) is standard equipment on the 5 Oceans along with 10 lbs 4. 5 kg in rear trim pockets. Your weights stay in position throughout the dive and do not shift around affecting buoyancy or position in the water. The weight pouches are simple to load and easy to release, best of all, the patented "positive-lock" system helps to ensure that they'll stay put. Rugged design and high lift capacity for local diving plus packs flat for travel and weighs just 7.5 lbs. Minimalist rear inflation air cell uses a combination of Patented Bioflex® material and bungy cords to maintain a streamlined profile and eliminate air shift while stretching when inflated to provide more than 40 lbs. Durable, Fadeless 1,000 Denier Cordura Shoulder and Pocket Panels. Equipped with two trim weight pockets and Aeris' QLR Integrated Weight System that can accommodate up to 30 lbs. 20 lbs (9 kg) QLR Ditch-Able Weight System. 10 lbs Weight Trim Pockets. Weight pockets are sectionalized with velcro to eliminate shifting when partially loaded in the tropics. Versatile power inflation/deflation with lower pull-dump control. Easy to use drop-down pocket. Strategically placed stainless steel grommets for accessories. Dual-adjust sternum strap for stability and comfort. Carry handle and Tank positioning strap. Carabiner with multiple attachment points. The item "New in the bag AERIS 5 OCEANS bcd, 2XLarge" is in sale since Wednesday, March 28, 2018. This item is in the category "Sporting Goods\Water Sports\SCUBA & Snorkeling\Buoyancy Compensators". The seller is "ceascuba" and is located in Catharpin, Virginia. This item can be shipped to United States.